Call it what you will – hot pad, mug rug, trivet – but I’m sure you can find a spot in your home for this little guy. 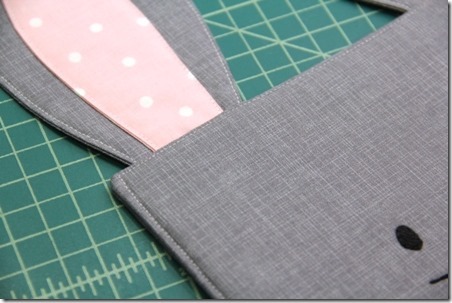 The second in my Hot Pad series, this bunny is easy to make and would make a perfect spring gift. As I promised, he has the same shape as the Mug Hot Pad from last month. I thought about calling him March Hare, but seriously, look at that face. He’s definitely a bunny. Adhere the interfacing to the back of one of the heads and two of the outer ears. 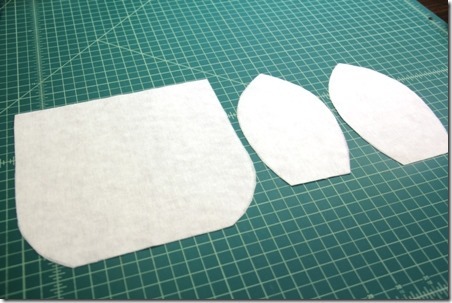 If you’re using different prints, the interfacing goes on the side with the face. Trace the face on the paper pattern with the embroidery transfer pen, then iron onto the fabric side of the head with interfacing. If you want to skip the embroidery, just use a fabric marker and a light source to trace the pattern onto the fabric. Use the craft thread to embroider the features. I added a little pink to the nose, but that part is optional. Pin two of the inner ear pieces with right sides together. Stitch 1/4” from the edge, leaving the bottom open. Clip the seam at the tip, turn right side out and press. Repeat with the remaining two pieces. 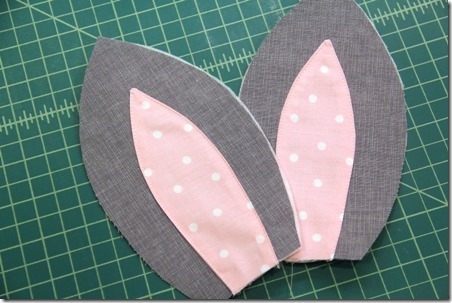 Pin the inner ears to the center of the outer ears with the interfacing. Stitch around the inner ear, close to the edge. Pin the remaining outer ears to these, with right sides together. Stitch with a 1/4” seam, leaving the bottoms open. Clip the tip, turn right side out and press. Topstitch close to the edge. There’s no need to topstitch the bottom edge, as it won’t be seen. Lay the InsulBright bunny head down, shiny side up. Lay the embroidered fabric head, face up, on top. Add the ears, each 3/4” from the side with the pink side down and the tips facing inward. After pinning them at the top edge, pin the rest of the ears back with safety pins so they won’t get caught in the side seams. Lay the back head over the top of the ears, right side down. Add the batting on top and pin all the layers together. Stitch around 1/4” from the edge, leaving 3” open at the bottom. Clip the corners, turn right side out, unpin the ears and press, turning in the opening. Stitch all the way around, close to the edge. I’ll bet you know someone who wouldn’t mind finding this bunny in their Easter basket!